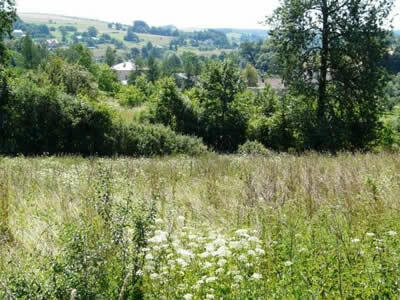 Bircza is a small village, about 40KM from the Ukraine border in South East Poland. It's nearest "large" city is Prsymsl, about 30KM away. Lvov, the largest nearby city, is about 50KM away. This small farming village cannot have a population greater than 500 persons. To drive through the village takes approximately 12 minutes. Bircza's sole industry is agriculture. The village gives the impression that is agriculture that is of a subsistence nature. The people speak no English, are all in excellent shape (as a result of working the land all day), and appear to be "simple people". These people were not "wood chucks", a term typically attributed to the poor white underclass of Central New York, which is what I was anticipating. At 11.00 on Sunday, the church was full. In fact, people were standing outside the church, some 20 persons, I estimate, listening to the service. People were properly dressed, although simple outfits and clean shaven. The attendees were not all older individuals; in fact, it appeared younger people, with families, than older people were attending. Could it be that 40 years of Communism wiped out and no semblance of religion below the age of 40 and this was a religious rejuvenation? My quest to visit Bircza results primarily because I am an American who has lived in Switzerland for almost a decade. Particularly since 2003, living outside the US with the sole travel document being a US passport has become a bit uncomfortable, if not dangerous. Poland joined the EU in 2005. Thus, living in Europe and having a Polish passport has become quite advantageous, aside from the plus of not having to travel in the Middle East or Asia on a US passport is also a plus. The idea for obtaining a Polish passport comes from my friend, Theodoro Flank, a 61 year old gentleman, whose father immigrated to Sao Paulo after the Second World War. Theodoro's father, born an observant Jewish man, married a woman of similar background and then raised his family Catholic. Theodoro, learning more and more about his past, began a return towards understanding his past. Theodoro about 3 years ago told me he was trying to get a Polish passport because having only a Brazilian passport had become uncomfortable. He, and his partner Marco, were also looking to have the ability to retire in Europe. Theodoro eventually got his passport. I let the idea die for a while until earlier this year. I was speaking to my partner, Slawomir Boruc, from our Warsaw office. I was planning a trip to help promote the Polish private banking practice. Parts of being Chair of the practice for Europe is to help offices looking to grow/develop their practices in this area develop them. In planning for my trip to Warsaw, I said to him I'd like to visit Birch, the village my great grandparents were from. Slawomir, laughed, and said there is no city called Birch. Slawomir then called a young law clerk and told him to "make Marnin happy, see what you can find". About 2 days later, I get an e-mail from Slawomir, he said not only did we find the village, but there is a website on the town and it is Bircza, not Birch. Slawomir then wrote me stating that since the Jewish population was killed all in one day, which is documented, I'm entitled to a Polish passport if I can prove my family lineage to Bircza; that's when I decided to visit. My great grandparents are Morris Lewis (ML), or the Hebrew name Moshe Leib (Yehuda in Hebrew) and Minnie Mond. My Hebrew name in Moshe Yehuda as ML died about 2 month before I was born. Minnie did not have a different maiden name, because ML and Minnie were first cousins. Best we can tell, there was probably some 20 brother and sisters between them. I knew Minne quite well, she having died when I was 18. What I can gather is that ML moved to the US in 1908. He was a child prodigy in Talmudic and rabbinic studies, and he would have been the town's rabbi when he got older. However, he ran away to the US because he didn't want to be a rabbi and wanted better than the poverty that Bircza had to offer. I believe he brought Minnie to the US in 1912. They last account we have of any part of the family being over to Bircza was in 1928, when ML returned to offer his family the ability to move to the US. He offered to pay for their trip. As the story goes, his family refused to go because they had all they needed. In 1929, ML lost all his wealth as a result of the great depression. By the 1930s, ML didn't have the money to bring his family to the US and they last of the story ends in 1942. The exact date is not known, but the Jewish community was rounded up in 1942, taken just outside the cemetery (all 240 of them), lined up, and shot. As I understand, one person survived and got to the US to tell the story. Between the Jewish cemetery, or what is left of it, and the gentile cemetery, one needs to walk down and then up. I have no basis to justify this thought, but as I climbed it, and it is not more than 10 feet high, my reaction was that this is where my great grandparents' brothers and sisters met their end. To get to Bircza, I had to fly Zurich to Warsaw. I then had to overnight in Warsaw. At noon the next day, I flew Warsaw to Rzeszow (an airport with no terminal, just a small room from which you arrive and depart). I then picked up my luxury Volvo; this being the only car Avis rented that had GPS and an automatic transmission. Armed with my GPS, I began the two hour drive. Rzeszow is a fairly modern city that reminds me of any suburban German city. There was 24 hour Tesco's, MediaMarkt and, of course, a McDonalds. However, 30 minutes out of Rzeszow, the roads became single lane and the quality deteriorated. The topography was full of rolling hills and agriculture; similar to either Central New York or Northern Switzerland. However, the agriculture was rudimentary. There were literally, scare crows and I didn't see a single tractor. What I did see is a lot of men, shirts off, working hard in the fields. The land did strike me as very fertile. All I could see was green in every direction. And, I could see why people settled in this region. In an era of subsistence farming where the economy was just about putting food in your family's stomach, this was a pretty good place to live: the land grew plenty, there was many rivers/streams for water, and fish was plentiful, albeit were talking about carp and catfish. I could see why to people that emigrated 500 years ago why this was paradise. she lived in a much hotter environment with no electricity. I can only imagine what the winters were like. To ML and Minnie, Crown Heights, the part of Brooklyn they lived in, must have been a paradise. The streets were paved; there was running water and electricity in the house, and food was plentiful. ML, who was a very ambitious guy (I grew up hearing stories on how he would walk to work on Shabbat) to do business, he had his dream, the ability to earn a living. ML must have done very well as Minnie lived almost 19 years after ML died and wanted for nothing. In fact, Minnie even left some money to her grandchildren (Mildred, my grandmother, died 8 years before Minnie). Getting back to the trip to Bircza, I left for the airport at 17.20 to catch a 17.38 train to the airport. My flight was supposed to leave at 19.55. I was leaving plenty of time to get to the airport, something I almost never do. Truth be told, I had a couple of very bad weeks at the office and I was just looking for an excuse to get out of the office for a bit to clear my head. My flight was delayed almost three hours and I didn't arrive in Warsaw until almost 00:30. I noted the time I arrived in Bircza, 15.48. I took me almost 22 hours from the time I left my office until the time I arrived in Bircza in my luxury Volvo. As I arrived, I thought to myself this was not the easiest of trips. Then, it dawned on me: 100 years earlier ML made the trip to America. I'm 100% certain he had no GPS and ML probably had to walk to the nearest train station, which I assume was about 40 KM away. From there, I don't know how he made it to the US, but the trip was certainly much harder than the trip I made. this was it! With the possible exception of the Church and the home of the priest, which I understand is the old synagogue; all the other building is Soviet era buildings with the traditional cinder block design. I looked at these buildings and realized nothing in this square is anything ML or Minnie would recognize and none of the houses outside of the town were anything they would recognize as they all appear to be Soviet style or post-cold war buildings. I can only guess that anything left after the war was used for basic survival and wood must have been a premium. Being around 16.15, I decided to go to my hotel, which was about 15KM away. This is the only hotel for 30 KM. The Hotel Krasiczynie, in Krasiczyn, is a 600-year old castle that was converted into a hotel during the Soviet era. That is when I saw the cemetery. I drove to the cemetery to see what I could find. 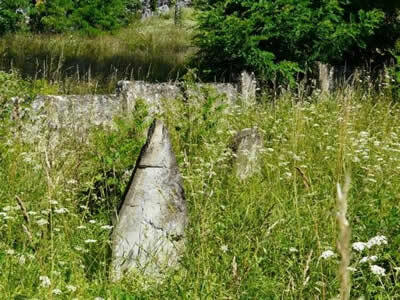 The cemetery was immaculate; but, I could see to the right, an indentation, followed by high grass, followed by a bunch of stones. 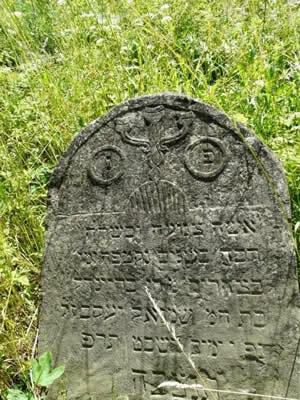 I realized that must be the "Jewish cemetery" because I had been warned it was near the gentile cemetery. However, because I did not have the proper clothing on, I decided to wait until the next day, wearing the appropriate gear (boots, pants, gloves and cutters) to go to snoop around. Going back to the hotel, the rooms were sufficient and my "standard room, with breakfast" cost a little more than US$22. 100 years back, 15KM was a large distance and the roads were certainly worse than the road I travelled on, yet I kept thinking to myself all night: I wonder if Grandma More knew of this castle? Had she been here? Had she seen it? I ate dinner at the Hotel. For dinner I had a salad and fried carp with broccoli and potatoes. Dessert was cheese cake and raisins. During dinner, the food, which I was wary of, had a real comfort as it tasted almost familiar. Somewhere during dessert I realized that the style of foods was in the style grandma used to cook. The fried carp was really nothing more than the gefilte fish grandma used to make (not the horrid stuff one gets out of a jar with that putrid jelly). The cheese cake reminded me of the cheese cake I would see in the bakery on Kingston Avenue in Crown Heights. As I mentioned earlier on, I have had a very hard last few weeks. I used the opportunity to get to sleep early (21.45) because I was exhausted and slept until 8.30. I had planned to get up earlier, but then realized that I'd get finished in Bircza earlier and get stuck staying at the airport with nothing to do (which is where I wrote this note). I'm not normally a breakfast guy, but I realized I might not find any places for lunch. Breakfast consisted of a buffet of pickled cucumbers, pickled tomatoes, pickled mushrooms, creamed herring, normal herring, bread, cheese, butter, and cream cheese. I noted the absence of any traditional breakfast items (cereal, eggs, etc). There was coffee, but it was instant. Tea was abundant. During breakfast, I had the most vivid memory of sitting in the kitchen of Minnie's apartment in Crown Heights, with almost all of the same foods on the table. By itself, the story might not be so memorable, except that I was at best four when Grandma moved from Crown Heights to Far Rockaway. Then, as I was finishing breakfast, I saw a couple making a sandwich of butter, cheese and creamed cheese. Another memory came back to me: we had just spent the day at the beach and we stopped by Grandma's apartment for a snack. She made us these horrid sandwiches of cheese, butter and cream cheese and I vividly remember refusing to eat the sandwich. Again, I was probably 7 years old at the time of this event. Both meals took place in the "wealthiest" part of town, in the castle. While there was plenty of food, the food was not plentiful. And, this was not food from Brazil or Chile. The produce was locally grown vegetables and carp locally fished. I then had a realization: people moved to this part of the world because it grew food, something that cannot be said of all parts of Europe. However, the farming technologies of the early 1900s meant that that the living was subsistence. When Minnie was always asking me if I wanted "more", and hence the name "Grandma More", this was in Minnie's mind, the greatest gift she could be giving was more food. The world she grew up in didn't have more to give. Food was limited and there was not the gift of being able to give more. 18 years after her death and some 30 years after I coined the name, I now understand why she was always asking if I wanted "more". This was not my first trip to Poland. In fact, it was my fourth trip. My first trip was in 1989 when I went with USY to their Poland Seminar  Israel Pilgrimage. That trip was an introductory to the Holocaust first hand. We visited all of the traditional camps and Jewish sites. The trip had an impact, but since I was not immediately touched by the Holocaust, given that all of my grandparents were born in the US. In fact, both grandfathers served in World War II. On my grandfather Irving's side, his grandparents are actually buried in Brooklyn, although his parents immigrated to the US. This first trip was before "the Wall" fell in November that year. It should be noted that Poland was the first European country spent any significant time in. The next two trips were for business to Warsaw and they were in the last two years. This Warsaw, the "new Warsaw" bears no resemblance to the Warsaw of 1989. This Warsaw is full of sky scrapers and both trips were for a total of 72 hours in which I didn't have a chance to focus on anything else other than work. This trip I was on a "mission" to prove a connection to Bircza to get a passport. Although, truth be told, I had already located the birth certificate of ML, Mosze Mond, in Lvov and I had already arranged for a partner of mine from Kiev to get a copy. But, I wanted to find "something more" so that proof connecting me to Bircza was stronger. 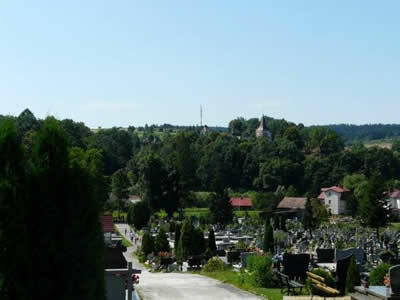 The town of Bircza, today, is at best 500 people. In 1942, the Germans killed 240 persons all Jews, in one day, exterminating the Jewish population from the village of Bircza. Assuming the Bircza population stayed constant, 1/3 of the population of this village was Jewish. I note there is nothing indicating this community had a Jewish population and if one did not know of the Jewish cemetery, the only item indicating there was a Jewish population, one would never have known it existed. I suspect this village was at least 60% Jewish at the time ML moved to the US. The drive back to Bircza from Krasiczyn took about 30 minutes. I immediately went to the cemetery. Today, armed in work boots, long pants and shirt, gloves and clippers, I made my way back to the Jewish cemetery. It took me about 30 minutes to cut myself a path in. The grass was chest height. I finally got to a collapsing cement wall was that was broken. That is when I saw the first stone. While the Yiddish was still readable, I didn't see any names that I recognized. Of course, there were no last names only "Hebrew names" such as "Yehoshua ben Yaakov": Joshua son of Jacob. I then spent the next hour cutting through grass cutting through to see stones. There are maybe some dozen stones left. None of the stones are in good condition. Most have some readable Yiddish, but many do not. I did note that most of the stones used the word "bat" or daughter of. For whatever, reason, more stones for women survived then for men. About 1.5 hours after I started, I realized that I had pretty much seen all I would see given the conditions of the cemetery. I also realized I had probably walked over the place where my ancestors lay to rest: either from the hands of the Nazis or from natural causes. At that point, I took out the kippah (skull cap) and siddur (prayer book) I had brought with me closed my eyes and said the El Maleh Rachamim and Kaddish (the prayers for the dead). Somewhere during the El Maleh, the tears started coming out of my eyes as I finished the prayer. At that point I realized, had ML not have wanted to find a better life, he and Minnie would have ended up in this very cemetery and my family would not here today. On the fourth trip to Poland, almost 20 years after my first visit, it finally hit home exactly the impact the Holocaust had on my Grandma More, Pappa and Mamma (and even my mom) behave as they did/do. It took me about 20 minutes to get back to my car. I drove over to the down to walk around a bit and wait until it was late enough to call my mom and ask me if she wanted me to do anything. She asked me to take a stone, which I did. I then proceeded to drive back to the airport, but I chose to take a scenic route (thank goodness for those GPS machines). It took me about 3 hours back to town. I crossed into the Ukraine a back viewing the beauty of the rolling hills and countryside as I made my way back to Rzeszow Airport. I wish I could say that I realized something profound on way back, but all I said to myself was I'm 5000 miles away from where I came from, but the landscape isn't all that much different. I wish I had some profound concluding statement on the events of the forty eight hours that made up this trip. Unfortunately, I don't.